Twenty-five years ago, I feel in love with the animated classic Beauty and the Beast. To this day, it remains one of my all-time favorite Disney movies. When the news broke that Disney was going to be doing a live action version of this classic, I was excited and skeptical. Would it live up to the original? How would they bring all the amazing characters to life? I waited with baited breath for every clip release, entertainment story, and sneak peak in hopes of learning more about the new Beauty and the Beast. The more I saw, the more excited I became and when the movie was released in theaters, I immediately bought my ticket. From the minute the opening scene began to close of the last credit, I knew this live action version had won a place in my heart. This is precisely why I’m excited to announce the release of Beauty and the Beast on Digital HD, Blu-ray™, Disney Movies Anywhere, DVD and On-Demand. Starting today, June 6th, 2017, you can own this tale as old as time for yourself. 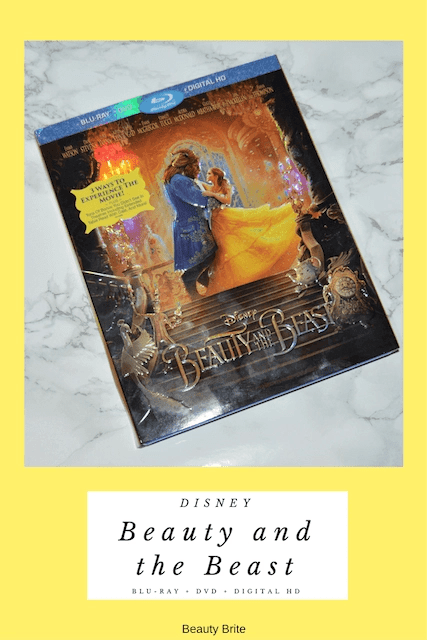 And in classic Disney style, there are three amazing ways to watch the new Beauty and the Beast – the original theatrical cut, the premiere cut with overture, and a musical experience with sing-along. I’ve already spent some quality time with the bonus features and I highly recommend checking out the Table Read. It’s unlike anything you’ve seen before. I also really loved “Days in the Sun” extended song, a Beauty of a Tale and From Song to Screen. There’s so much to enjoy about this new Blu-Ray+DVD+Digital HD. I can’t wait to share another Beauty and the Beast favorite with my nephew and nieces, who I know are already fans of the animated classic. I have a feeling they will really enjoy the sing-along experience. Have you seen the new Beauty and the Beast? Who’s your favorite character from the movie? I totally missed this in the theater, so I am really excited that it’s coming out on DVD so I an catch up! I know it’s going to be awesome. I already was waiting for our DVD to arrive- now I am sooo excited for the bonus features, especially the table read and deleted scenes!! I haven’t seen the new one yet but I always loved the old one. I wonder if I’ll like it as much or more! Aww I love Beauty and the Beast, I haven’t watched the new one yet. I really love the singing in the old film!! Not had the time!! We went to the theaters to see this one, and can’t wait to own it! We really enjoyed this version. I was a kid when the original came out, so I had my doubts, but they nailed this one perfectly! I haven’t seen it yet. I haven’t seen the original in years! I am going to do a girls night and watch them both back to back later this year! Oh I have not seen this one in the theater yet, however I am so excited to get this one on DVD! II am a big Disney fan and definitely a beauty and the beast fan! The latest one is absolutely fantastic and I would love to gift this as a copy to my gurlfriends. Wow! This is good news. We now have the chance to keep this movie in our collections. I’m so happy that they’re finally releasing a DVD of the new Beauty and the Beast. I think this was my daughter’s first introduction to a Disney Princess. We each have our own! (Mine is Cinderella!) I cannot wait to get this and watch this with her! We saw this film in theaters and my oldest loved it. I admit, I did cry a little at the end. I wanted to see that in theaters so badly, but my son wanted to see something else so he won. He promised me we would watch it when it came out on DVD, though. I am definitely bringing this one home! I loved this new version. Excited to see it again on DVD, especially with all the fun extras. I fell in love with the original Beauty and the Beast. I have to admit that I haven’t seen the new one yet but I can’t wait to do so. I LOVED this movie! My favorite character has to be Bell, Emma Watson did such a great job! I can’t wait to watch it again. I’m so excited to have this film on DVD! It’s definitely a classic we will love for many many years. I would love to own a copy of this. I did not get a chance to see it in the theater, so I would love to see it at home. I bet it is good. Beauty & the Beast is one of the few Disney movies I ever liked as a kid. I loved this new one so much! I can’t wait to buy the DVD so I can watch it again.